An aggregate fruit is a fruit that develops from a single flower, but the flower has more than one ovary, and the ovaries join together as the fruit grows. A fruit that grows from just one flower that contains just one ovary, is not an aggregate fruit but a simple fruit. 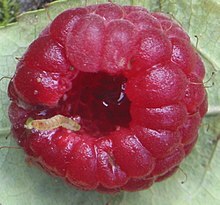 Not all flowers with multiple ovaries grow into aggregate fruit; the ovaries of some flowers do not become tightly joined together to make a larger fruit. Aggregate fruits may also be accessory fruits. In accessory fruits, parts of the flower that are not the ovary become juicy and form part of the fruit. Strawberry is an aggregate fruit and is also an accessory fruit. The small dark-coloured dots on a strawberry are the ovaries. The juicy part of the strawberry grows from the base of the flower. This page was last changed on 9 May 2015, at 12:03.